Digga-Leg is a robotic boss from the game Super Mario Galaxy 2. It is fought in the Spin-Dig Galaxy, first in the mission Digga-Leg's Planet, and later in the mission Digga-Leg's Daredevil Run under Daredevil Comet conditions. Digga-Leg resembles a smaller Megaleg, though it has only two legs and its eyes emanate a red glow. Because of this, it also resembles a Snifit. Its shape is similar to that of a Swaphopper. Its weak spot is its glass underside, which contains a Power Star. It lets off steam periodically. When the player first encounters it, it slowly activates, then massively lets off steam before attacking. Mario battling Digga-Leg in the Spin-Dig Galaxy. Digga-Leg attacks by stomping around the planetoid and creating Diggas, which burrow through the ground's surface and try to harm Mario. Mario can defeat the Diggas by stomping on their heads or by drilling under them. When angered, Digga-Leg will jump high into the air and come plummeting down, damaging Mario if he's in the way. Mario drilling through the ground to attack Digga-Leg. The only way Mario can defeat Digga-Leg is by using the Spin Drill to burrow through the planet from the position opposite its glass underside. Each time Mario drills into the glass, it will become increasingly cracked. This will only work if Mario starts drilling from the right area of the planet at the right time. If he misfires, he will either run into one of Digga-Leg's legs or the protected part of its head and be bounced back (with an accompanying clang sound). After Mario cracks Digga-Leg's glass underside three times, it explodes, leaving behind the mission's Power Star. There is also a Prankster Comet for this fight. Digga-Leg has the same attacks as before, except it is a daredevil fight, therefore the player only has one health point, making the boss fight significantly harder. Defeating Digga-Leg will give the player a silver crown next to the galaxy's name if Silver Stars Down Deep has also been completed. Horihori reggu Diggin' Leg, horihori is from the Japanese verb horu which means to dig. Digga-Leg shares its boss music with the Whomp King. 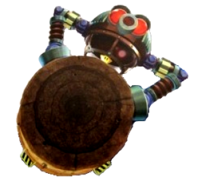 Unlike most large enemies, if Mario is hit by its legs, he simply gets knocked away and takes damage instead of getting crushed. Digga-Leg was originally going to be called "Digg-Leg", but this was changed in the final version of the game. Digga-Leg can be seen on its planet in the background of the Super Mario Galaxy 2 Puzzle Swap panel in StreetPass Mii Plaza for the Nintendo 3DS. This page was last edited on February 21, 2018, at 06:11.